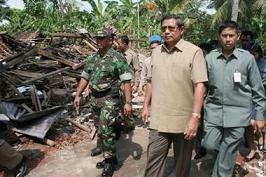 "At one such warehouse, owned by the Bantul regency administration, donated goods were beginning to pile up. Officials said the assistance would be distributed through district chiefs. " "officials said the supplies were not reaching survivors quickly enough as victims pleaded for money on debris-filled roads to buy food...relief supplies remained inadequate. 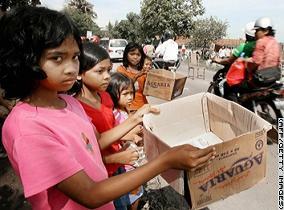 "Hundreds of villagers lined main roads in the disaster zone, holding out donation boxes. They explained that any money collected would be used communally to buy rice, oil and candles. " "Carrying small pouches and old boxes on which the words "Quake Donations" could barely be made out, the old and young, women and children sought handouts from passersby. " "We should be ashamed of begging, even to the government. We must bear our fate," the old man insisted."